“Score one for the little guy!” describes Makita’s LS0714 Quad 10 Amp 7-1/2-Inch Single Bevel Sliding Compound Miter Sawperfectly. It’s small and light, but it’s also powerful, smooth, and extremely accurate with a large capacity for such a small miter saw. Delivering features like electronic speed control with both soft start and electronic braking, incredible dust collection, and glass smooth cuts, the LS0714 is ideal for the both the home do-it-yourselfer / woodworker and a range of professionals including finish carpenters, floor installers, remodelers, and general contractors. Unless you absolutely need the greater capacity of a larger miter saw, Makita’s LS0714 will take whatever you throw at it with no problem. Users report that it performs flawlessly whether you’re cutting pressure treated lumber or dense hardwood, with plenty of power for any job. Accurate right out of the box, the LS0714 is able to handle 2″ x 12″ lumber at 0° miter / 0°bevel, and 2″ x 8″ at 45° miter / 0° bevel. A hold down clamp is provided on the left side and does a good job of keeping stock in place. The LS0714′s 10 AMP, 6,000 RPM direct-drive motor employs electronic speed control to improve performance, and is designed to never slip or bog down like belt-drive units. The high 6,000 RPM speed is one of the factors delivering glass smooth cuts. Power to cut through even the densest hardwood is made user-friendly by the soft start and electronic brake features. Owners indicate that both the soft start and brake are very fast (near instant start-up / stops in a second or two). The Makita LS0714 achieves it’s tremendous accuracy through a combination of both features and general characteristics. 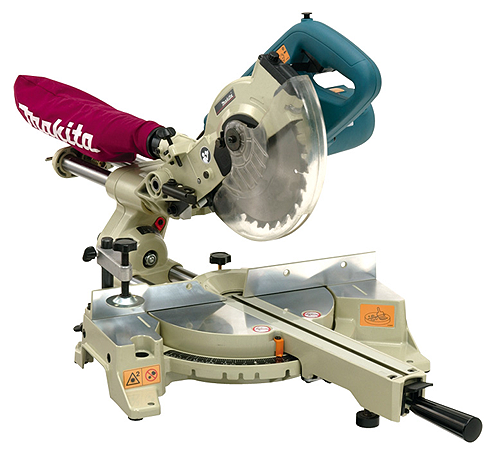 The 7-1/2″ miter saw blade has no flex or wobble, which can be a consideration with larger blades. Makita’s four rail (two top, two bottom) / four linear ball bearing design keeps saw head deflection to a minimum, even with a long sliding distance. A large machined aluminum base with “buttery smooth” miter table movement provides additional stability. Users generally indicate that the Makita miter saw blade included with the package is excellent, producing smooth, fast cuts. Note: According to users, the linear ball bearings on the Makita LS0714 may require a very short break-in period before they smooth out. 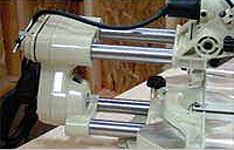 Dust collection on miter saws is usually questionable, with a 50-75% capture rate being very acceptable. However, the Makita LS0714 delivers dust collection that draws rave reviews from most users, some saying that while it’s excellent with just the included dust bag, it collects virtually all the dust connected to a shop vac. At 27.6 lbs. this miter saw is light in weight, but no lightweight when it comes to fit, finish, and a soild build. Obviously, close tolerances and attention to detail during assembly contribute to the LS0714′s superb accuracy and solid feel. The most common complaint was the limited selection and high price of 7-1/2″ miter saw blades, but several users suggested 7-1/4″ blades made for circular saws worked well and were less expensive. The Makita blade included in the package got high marks for quality. Some users wished there was a hold down clamp on the right side in addition to the one on the left, and others would have liked a dual bevel feature, but these were considered more a wishlist as opposed to flaws. 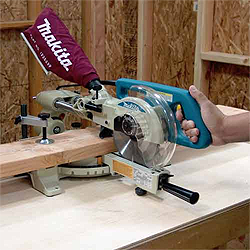 What do owners have to say about the Makita LS0714 7-1/2-Inch Sliding Compound Miter Saw?